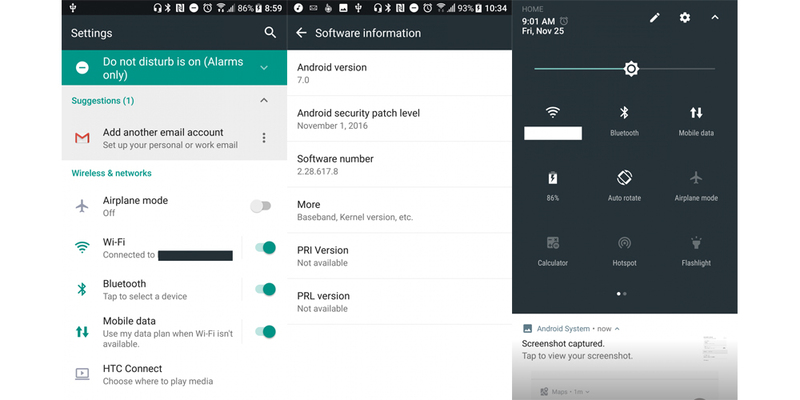 HTC has begun deploying the latest version of Android for the HTC 10, the latest high-end smartphone released by the manufacturer. This HTC move could be due to an attempt to anticipate Samsung fast enough that at least users of the Taiwanese company test the final version of Nougat at the same time as the third beta that can be found in the Samsung Galaxy S7 and S7 Edge (thanks to Galaxy Beta Program). In any case, HTC has not made known exactly whether the deployment will consist of the latest version available (Android 7.1 Nougat), or if we talk about Android 7.0 Nougat and we will have to wait for an undated future update for now. Obviously these are minor details, since within the firmware will be present the latest developments, including the latest security patch of November, but many would prefer to have the bugs solved and improvements updated. At the moment the firmware is only available in the US, but in fact it will not take long to start the official rollout in Europe, but before this happens, we have already been able to obtain directly from the network a series of images that show how Android runs on the HTC 10. The first thing you can see is that HTC has not radically changed the look of the operating system, leaving most of the classic features of Android Nougat just as Google designed them. Quick toggles, notifications center, settings... all were left with default layout. In view of which, we will be waiting for the official firmware release also in other countries where it should arrive sooner rather than later. The HTC 10 will thus be the first HTC cell phone to get Android Nougat. We recall that the HTC 10 Evo will be put up for sale in some markets this week with a custom version of Android 7.0 Nougat and powered by a 3,200 mAh battery. Available for purchase at a price of £ 399 ($ 460), it will be the second HTC smartphone with the latest operating system from Google.